"At Last... Finally A Way To Sit Down At The Piano And Easily Play All Your Favorite Christmas Classics In Less Than 3 hours --- Without Sheet Music!" ...Even If You're A Total Beginner. Are you ready to be taken by the hand and shown, step-by-step, how to play all your favorite holiday classics by ear? ...With my tested and proven 3-step learning process, you'll learn everything you need to know to play basic, extended, and 'vocalist' versions of your favorite Christmas songs --- without reading sheet music or chord charts! Basically, I'm going to teach you three versions (basic, extended, vocal) of every song so it doesn't matter if you're a beginner, experienced, or otherwise --- you'll have what it takes to play these songs according to your own skill level. ...Simply put: If you're a beginner, stick with the basic versions of the songs (demonstrations shown below). But if you're experienced, you can go right to the extended and vocal arrangements of the songs --- and you can even learn the basic versions for review! It's totally up to you. "God has truly given you a knack for teaching. You have a very unique gift of being able to teach and make things so plain. I can't tell you how many teachers I've been through but as soon as I stumbled across your website, I knew this was something different. Your videos have taught me more in a few hours than I've paid hundreds of dollars for in the past. I pray that you stay encouraged and continue to do what you do." How would you like to play all of your favorite Christmas classics like "O Come All Ye Faithful," "Silent Night," "The First Noel," and others... ALL BY EAR? ...And I don't mean simply teaching you chords and sending you on your way to tackle these songs on your own. I'm talking about teaching you, step-by-step and over-the-shoulder, how to play these songs by ear with the process I've used to teach literally thousands of musicians around the world. Understanding how music works (how chords are formed and how they combine together to create progressions and songs). Determining the melody of a song, finding the chords that best support the melody, and adding "extra" chords and fillers to create full-sounding songs. Recognizing that chords repeat themselves over and over in songs and being able to identify the patterns in these Christmas classics! Having fun while learning pastime carols that can be shared with family, friends, and guests during this holiday season! What better way to enjoy the holiday season than to be able to sit down at your piano and play all of your favorite Christmas songs by ear? I've come to recognize what musicians want. ... But not only that. Being a huge fan and instructor of music theory, ear-training, and an enthusiast of all kinds of music genres, I understand not only what musicians want, but also what they need in order to take their piano playing to the next level! After literally hundreds of requests over the years to teach holiday tunes, I've finally locked myself in the studio with my production crew and have come up with the ultimate system to learning Christmas classics ... all by ear! I've designed the program so that it doesn't matter what your skill or experience level is. Regardless of whether you've been playing for a month or perhaps several years, you'll still benefit from my instruction. There are three sections for every song I teach. The first section deals with the basic version of the song. This is the breakdown of the melody, harmony, and the associating chords that will be used to play the song. This is where a beginner would start (...but over time, my experienced students have benefited from my theoretical and basic approaches to learning songs so that's not to say that an experienced person would skip this section). So, technically, by the time you finish the basic version of a song, you'll have what it takes to play the song exactly the way it should sound. It is then up to you whether or not to advance on to the extended version of the song. The second section focuses on the extended version of the song. After you've broken down the anatomy of the song and have dissected it part-by-part in the basic section, the extended version will give you a countless number of ways to spice up the song. From left-hand enhancements to jazzy right-hand voicings... from fill-ins to runs and extended chord progressions, you'll give your basic version a complete make-over. Finally, the third section is centered around accompanying a vocalist. You'll see, firsthand, how to use all the chords, progressions, and melody lines with a live singer! This will also allow you to observe the differences between the basic and extended versions in live performance mode! When I say "basic" and "extended," I'm not making one better than the other. Believe it or not, some people like holiday music, as is (without all the fancy voicings and add-ons). Others like to play their songs spiced up. That's why I've included all of these different versions. You'll get to decide what you learn --- instead of having to buy separate courses and paying more for different levels of training (as some recommended me to do). "Jermaine, you've been a blessing to my son. He begged me to order your materials from the internet. Honestly, I was very skeptical at first but my son was very persistent. I ordered the videos for him and the boy never left his room for hours. I don't know what gave him so much motivation to learn the piano but whatever it was, it kept him glued to the television for hours. I'm just glad he's found this hobby rather than all the other things he could be getting into. Now, he's actually beginning to play at his school and continues to practice several hours a day. I'm not a musician but I must say that he sounds really good. Thanks a lot Jermaine for everything you do." "I am a retired music teacher, band director, and a member of the board of education in the city of New York. I am currently working in a church part time as well. I have come across much music during my experience as a teacher but your course is far and away, the best I've ever seen. Even though I am a jazz instrumentalist and arranger, I have learned much in the short 2 weeks I've had this course. Your course has given me the same kind of freedom I have playing jazz in terms of opening up my creativity. Being a latecomer to sacred music, I am so grateful that God led me to your course. I will definitely be going through the other GospelKeys videos when they are available." Finally, you can start learning Christmas songs with your entire family, in the comfort of your own home without using sheet music or paying more than $30 a lesson this holiday season! ...Don't get me wrong. If you can afford it, there's nothing wrong with having a piano teacher. This course, however, will get straight to the point and teach you how to play your favorite Christmas songs by ear so you can enjoy them during this holiday season! Discover the secrets to playing Christmas songs without sheet music by understanding primary triads, chordal alterations, and circular progressions (...Don't worry if you don't know what these things mean --- I'm going to explain all of this)! How to find the melody of your favorite Christmas classics in a few minutes and how to literally transform the melody into a full-sounding song in less than 30 minutes! How three magic chords can help a beginner to play virtually any Christmas song they want (...and other songs for that matter) --- ALL BY EAR! An over-the-shoulder look at how to use JUST seven chords to harmonize virtually any series of melodic intervals. Learn how to spice up your left hand and how to make both hands work seamlessly together to improve the overall sound of your songs! "I've been purchasing materials from HearandPlay.com for about two years and they have never cease to amaze me with their professionalism. Everyone knows that there is a lack of resources out there for gospel musicians but no longer can it be said that there is no one catering to the gospel community. Jermaine and his team has definitely filled a void that many organizations have been unwilling to venture into in the past. As a corporate leader, I know the struggles and thank God for a company that is striving to excel in teaching musicians how to play gospel music by ear. God Bless You." Impress your family and friends during this holiday season by mastering Christmas classics like "Silent Night," "The First Noel," "Go Tell It On The Mountain," and more! Discover how knowing major scales can drastically decrease how long it takes to learn your favorite Christmas songs. Enjoy learning the "number-system approach" and how this method will allow you to pick up virtually any song by ear --- Christmas, gospel, jazz, blues, pop, etc! How eight simple notes can lead you to the melody of any song in less than 10 minutes. If you're aimlessly picking out melodies and chords without a proper method, you're wasting valuable time and energy! Train your ear to recognize famous Christmas chord patterns and common melodic intervals and how they are present in majority of holiday songs! Find out how to properly use arpeggios both on your left and right hands and how they enhance your playing tremendously. Learn several variations of each song so you never have to play these Christmas classics the same way every time! Discover the power of "inversions" and how changing one note in your chord can totally alter the way a progression sounds! Beginners: How to play an entire song with only three-fingered major chords (...also known as "major triads"). How to add fuel to your bass by understanding how "power" chords work in holiday music. Discover the power of "walk downs" with basic primary chords (...you'll learn this in "Silent Night")! How to sneak in "filler 13th chords" on your right hand to keep your holiday songs sounding full at all times. How to use split chords (e.g. - "Cmaj / Eb" or "Fmin / D") and superimposed voicings to add spice to a chord progression! The power of altered chords like "Db13#11," "C7#9#5," "Abmin7b5," "Bb9#5," "G7#5," and how they totally change the feel of a song! How to easily substitute 4 and 5-fingered chord like min7, dom9, maj11, and dim7 for basic triad chords to add depth to your playing! How to utilize the strength and pull of 2-5-1, 7-3-6, and 1-4 chord progressions in holiday songs like Silent Night, The First Noel, O Come All Ye Faithful, and more! From beginning to end: How to play every song, step-by-step, with no guessing (whatsoever) or any information left out! By the end of this course, you'll have what it takes to fully play all of these Christmas songs by ear... guaranteed! "HearandPlay has changed the way I look at music. Before, I would sit at my piano for hours trying to pick out notes. I didn't have a clue what I was doing but I had faith. A friend actually sent me an e-mail about HearandPlay a few years ago and it would take me a few months to get serious about it. But once I ordered your courses, I could see right away what I was doing wrong. The young man on the video talked a little fast for my old ears but yet made everything so perfectly clear. I've bought everything they have come out with since then as I hate to think what I would be missing out on if I didn't. God is really going to take these videos to the masses one day. I really believe it." My complete ChristmasKeysTM Series dvd course will teach you everything you need to know to get started playing Christmas songs by ear during this holiday season. I will show you, step-by-step, how to pick out the melodies of famous Christmas songs, how to choose the right chords to accompany the melodies, and how to spice up your chords and progressions to create full-sounding arrangements of your favorite holiday songs! If you've been searching for a course that'll take you by the hand and show you exactly what you need to know to play Christmas songs (...and other songs for that matter), then you've found the right place. Not only will you learn tons of Christmas songs, but you'll understand the theory behind these songs --- why the chords are played... alternative ways to play the same songs... why the melodies are constructed the way they are and much more. The learning never ends! Click thumbnails to view video files (Windows Media Player required). Click here if the Windows player doesn't load automatically. *Everything shown on the video clips above will be demonstrated, step-by-step and part-by-part in the course. ==> 90 minutes of step-by-step, over-the-shoulder footage on how to play all of your favorite Christmas classics by ear without the need for sheet music, chord charts, or any musical notation...whatsoever! ==> Over twelve segments of useful information and examples. Each song is broken into multiple segments that show basic, extended, and vocal arrangements of each song! So... it doesn't matter if you're a beginner or experienced, you can go directly to the segments that best fit your needs --- or study the entire course from beginning to end. It's all up to you. ==> Close-ups, Titles, and Charts to make sure you're playing the right melody notes, chords, and progressions at the right moments. This dvd course wasn't just put together. It was designed specifically to make sure you understand all of the techniques from a visual and mental standpoint. Plus, the author is very charismatic and energetic so your eyes will be glued to the screen for the entire course! ==> Emphasis of all techniques to guarantee that you never miss a beat. I will never quickly fly through anything that I teach you. In fact, I usually play all examples more than two or three times and reinforce what I'm teaching with visual aids like titles, on-screen descriptions, and more! ==> On screen demonstrations of key information, including major scales, chords, progressions, determination of melody / harmony, alterations, and more! ==> Timely titles and textual assistance for all melody notes, chord names, and left-hand/right-hand keys to play. ==> Convenient drop-down boxes containing lyrics and notes to all songs, displayed slowly, line-by-line. ==> Enhanced color and visually-stimulating graphics to keep your attention throughout the entire course --- not to mention the charismatic and energetic approach from the instructor. ==> Three strategically-designed approaches to learning every song: Basic version, Extended version, and Vocalist version. Regardless of whether you're a beginner or experienced, you'll be able to focus on the sections that best suit your needs (...from a very basic version to play each song to a more enhanced and extended version with a live vocalist)! ==> Picture-in-Picture mode which shows the instructor talking in the corner of the screen while showing the expanded view of the keyboard for enhanced learning and key points. ==> Animated, on-screen learning tools that keep you focused on the right information on the screen (...there's actually a box that moves around so that you know exactly what chord to play --- and WHEN to play it)! ==> Easy-to-Use chapter markers and menu selections designed so that you can skip from the basic to the extended and vocalist sections of each song! BONUS: ChristmasKeysTM Disc 2: "Christmas Classics Continued"
This second disc is loaded with more songs, chords, progressions, and full sequences (with recorded bass guitar, drums, organ, and keyboard) so you can see how some of the songs sound with a full band! ==> Enjoy learning "extra" fill-ins, churchy bass runs, and right-hand chordal movements that you can incorporate into your Christmas songs right away! ==> Enjoy vocal demonstrations of every song so that you'll know exactly where to use all the chords, progressions, and fill-ins taught in the course. This could have easily sold separately (as many have suggested) for $29 to $35 but it's yours absolutely free as part of this comprehensive program. If you're truly serious about learning Christmas classics by ear during this holiday season, then you won't have a problem with this deal --- at all. You'll be getting ChristmasKeysTM Disc 1 and ChristmasKeysTM Disc 2 (a $35 value by itself). Together, these discs total a whopping three hours of step-by-step instruction. Plus, you'll get the additional 3 Monthly Music MentorTM courses valued at $79.95. So you're not only getting 3+ hours of step-by-step dvd footage on how to play Christmas Classics but an additional 4.5 hours of audio training in free bonuses. Then there's the ongoing support of the mentor program --- what else could you possibly ask for? For all of this, I could very well charge over $130.00 and still get tons of orders for this three-hour, 2-disc set. I know 2 and 3-hour courses out there selling for $100+ so I definitely know the going rate for such valuable information like this. With typical values at $45.00 per 90-minute dvd (...and even $45 per disc is a giveaway) and the 3 free bonus courses, that price would be well justified. But I'm not going to charge you $130.00. I'm not going to even charge you $80... or $60. For just 2 easy monthly payments of $29, this entire 3-hour ChristmasKeysTM Series can be yours. This offer is subject to change at any time so if you're really interested in this dvd course, I suggest you act quickly --- otherwise, you might end up paying $130 or more in the future --- or worse, we'll end up running out. If not, my 100% "NO-RISK" guarantee should help you make a decision --- or you're just not serious about this. Even though the price is extremely reasonable (about the cost of dinner for two at a mediocre restaurant), here's what's really important. If this program was just another useless course that just sat in your bookshelf and didn't teach you anything new, it wouldn't matter what the price was. IT WOULDN'T BE WORTH ONE SILVER DIME. But if you can learn just a few new Christmas classics, dozens of chords, tons progressions, and more, what is that actually worth to you? If you'll finally be able to sit down at your piano during the holiday season and play Christmas carols like you've been desiring to over the years, what is this course worth to you? I can't put an exact dollar figure on it for you --- only you can do that. But I can tell you this: at 2 monthly payments of $29, this program could very possibly be the best bargain and the best Christmas investment and gift you'll ever make in terms of your musical growth. Click here if you're ready to take your piano playing to a new level. If, for any reason in the next 365 days, you don't agree this incredible program is worth every penny, simply return it (and keep the free bonuses as a gift). You will receive every single dime of your money back minus the shipping costs. You won't be sold another product. You won't be asked any questions. It's as simple as that. My accountant thought I was crazy to even offer ANY type of return policy or guarantee on a dvd or audio course because of the many ways people could cheat us... let alone a full 365-day year guarantee. However, I believe in my programs, and I believe in my students so much that I am willing to allow you to test drive it on me. Heck, I'm even willing to take on even more risk by letting you break up your payments into multiple months. So not only do you get the flexible payment plan, but you have a full year to decide whether this course is for you. At 2 monthly payments of $29, you are losing absolutely nothing and the risk is all on me. What else can I say? can print out for your records, click here. I've acted on my end of the deal ... now it's your call. If you think 2 monthly payments of $29 is too much for you, then ask yourself this question: "How fast will I spend this money on evening dinners, movie tickets, and a few outfits to wear?" Some of you can't honestly answer more than a few hours. I know I can't. I am trying to literally give you 180 minutes (3 hours) that will allow you to play all your favorite Christmas classics by ear (and the knowledge you need to play tons of other songs by ear with this same method)! Will you or someone else benefit greatly from this information during this holiday season? Have you been looking forward to playing Christmas music in the comfort of your own home (without sheet music)? Do you want to perform Christmas songs at a church service this year? Do you want to improve your overall skills by learning new chords, voicings, and progressions? If so, please do yourself a favor and take the first step. 2) Call toll free at 1-877-856-4187 (24 hours a day, 7 days a week) and mention "offer number CK1" to get the special offer price with the free bonuses mentioned above. * Overseas Customers please call 1-949-206-9591 (mention the same offer number)! The 3 hour dvd course is shipped via USPS Priority Mail or Express Mail. You will receive the ChristmasKeysTM dvd course in less than one week and can get started learning Christmas classics the very same day you receive it. You can literally be on your way to playing holiday tunes in no time! Do you have any questions at this time? If so, please click here to chat live with one of our knowledgeable Hear & Play Music representatives right now. We are here to answer your questions 24 hours a day, 7 days a week. P.S. Don't forget --- I am including the second disc ($45 value) and three additional monthly music mentor courses for free with this special offer. I honestly don't know how long this will last. All I can say is if you're serious about playing the piano, you'll want to take advantage of this special offer while you can. Otherwise, you might be one of those individuals who pay more than $130.00 for this same package --- or worse, we may run out of courses. 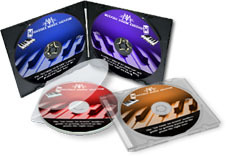 To receive your copy of the ChristmasKeysTM Disc 1 and 2 (180 minutes / 3 hours), Click here.